FDI has been a scary initiative for the small retailers. Much has been talked about the impact FDI will have on the business of these small retailers. But there is enough being done for the small retailers, one of such initiative is Saral cards. The bigger companies are eyeing this five crore establishment of small retailers as the most effective step to distribute their products. Last month with the Saral Money scheme, over 500 stores in Delhi have been enrolled in collaboration with payment gateway operator Visa. The Aadhar Card of an individual is linked to service for the unique individual identification number. This card will enable each retailers to upgrade himself in an effort to keep in pace with the technology. This enables each retailer to have a micro-ATM device which would allow the disbursal of Saral Money cards to the customers based on their Aadhar Number. This would allow them to withdraw money, make payments, and receive government disbursements among many other things. According to VISA estimates, there would be over 30 lakh outlets with 600 million people linked with Saral cards within 20 months. The charges for the transaction are also modest at Rs 5 for each and a new account would cost just Rs 50. 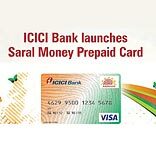 Saral is the joint effort of Visa and five banks ( State Bank of India, HDFC Bank, ICICI Bank,Axis Bank and Indian Overseas Bank) built on the UIDAI (Unique Identification Authority of India) platform with Visa as the payment network provider. All you have to need, to open a bank account for Saral is your Aadhar card. You can walk up to an authorised banking correspondent, which by the way can also be your local grocery shop vendor, fill a form with your name and other details, give a photocopy of your Aadhar card (which will also work as photo authentication) and authenticate yourself on the biometric reader through any of your ten fingers. This is more about providing easy banking services and is only the first step in the larger vision of financial inclusion of Aadhar. The next step would be to provide financial services to the people such as insurance, loan and other such products to increase their participation in banking in India. This initiative is also a step towards financial inclusion of all its citizens’ especially small retailers. In its test phase it is being populated in the national capital region and the response till now has been encouraging. A small glitch to this is that the card will only be given after the address verification which again brings back the problem for the very small retailers to become a part of it. Most likely, Saral is a step towards the financial inclusion of the small retailers and in a way unification of this huge group of small retailers.